Palm Sunday is April 14. Our services are at 8:00 and 10:30 a.m. We will begin each service in the narthex for the blessing of the palms. We hear there the Gospel story of Jesus' triumphant entry into Jerusalem. After we process into the nave with our palms, we continue with the Office of the Word. When we come to the Gospel, we will hear the account of our Lord's Passion from the Gospel of Luke. Maundy Thursday is April 18. Our service begins at 7:00 p.m. This service proceeds as on every Sunday in Lent, until after the Homily. At that point, we have the foot washing, which is essentially a reenactment of the Gospel story. We then go on to the Prayers of the people and the passing of God's Peace. After communion, the Reserved Sacrament is taken to the Altar of Repose in our chapel. Everything is stripped from the altar, as Jesus' clothes were stripped from Him; and the altar is washed and anointed as His body was in preparation for burial. Finally, the account of the agony in the Garden of Gethsemane is read and all leave in silence. Those who wish to follow Jesus' request - could you not watch one little hour? - go to the chapel to take turns praying at the Altar of Repose. 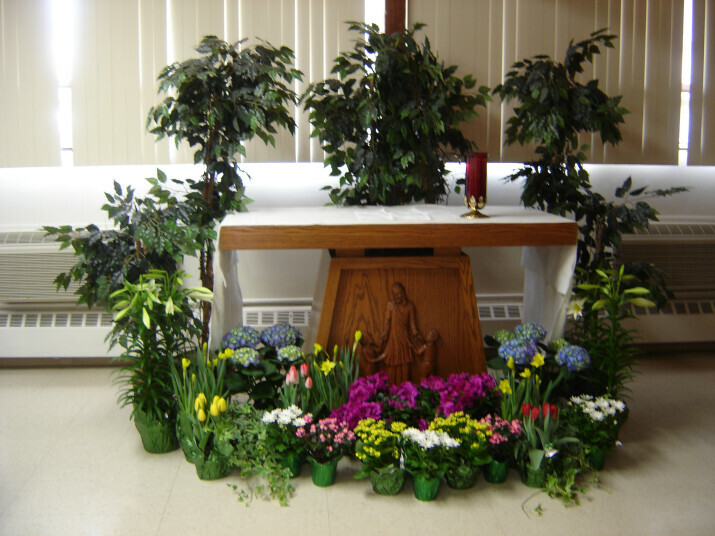 The Altar of Repose is decorated with flowers as one decorates a gravesite, and those who have chosen to keep vigil stay for one hour each throughout the night. This watch ends at noon on Good Friday. Good Friday is April 19. Our services are at 12:15 and 7:00 p.m. These solemn services begin in silence. Once again, the Gospel reading is of the Passion of Our Lord, this time from the Gospel of John. The Reserved Sacrament is brought from the Altar of Repose and we leave in silence. Easter Sunday is April 21. Our services are at 8:00 and 10:30 a.m. This joyful celebration of the Feast of the Resurrection is the highlight of the Christian year. Come join us in raising our prayers and thanksgivings in word and song to God. April 21, 2019 8:00 a.m.